You are now making your debut in the Indian Film Industry as Line Producer with your upcoming socio-psychological thriller Hindi movie “Dombivli Return”. Is this movie a sequel to your acclaimed Marathi hit “Dombivli Fast” in which you had played the lead role? Well, “Dombivli Return” is not a sequel to my 2005 Marathi movie “Dombivli Fast”. My movie is a socio-psychological thriller which speaks about a common man named "Anant Velankar" from Dombivli whose lead role has been played by me. Anant comes from middle class Marathi family staying in chawl and is working full time as a Photographer in Mantralaya with the PR Department. The look and feel of the chawl, dressing style of this middle class man Anant coming from Marathi family has given our Hindi movie a Marathi texture. Anant’s wife is an excellent housewife who takes good care of the home front. They have one small kid who is going to the school. Anant’s younger brother is a Commerce Graduate and pursuing his CA. Apart from pursuing photography as his full time job in Mantralaya Anant also works as “Freelance Photographer”. His regular friend circle includes his train friends whom he meets daily as part of his commute from Dombivli to work place and vice versa. He also has one of his friends from Dombivli who owns the photo studio locally. As this man is working in Mantralaya’s PR department his job profile gives him close access to work with Ministers. Why Dombivli? Do you have any memories attached to this beautiful place which even I do admire? Well, Dombivli is a beautiful suburb in the city of Mumbai located in Thane District. Many Marathi families who were once working and staying in Girgaon post their retirement made this beautiful suburb Dombivli as their new home which predominantly had Maharashtrian population then. On personal front yes I had the opportunity to stay in Dombivli when my parents were staying there for brief period of roughly three years or so. Today, also I do visit Dombivli when we have any family function or get together. What is the significance of the word “Return” in your movie title “Dombivli Return”? (Smiles) Good question. The word “Return" is like when one asks for a “Return Ticket” at the ticket counter when travelling. The “Return Ticket” grants one the permission to travel to one’s chosen destination and allows you to return back again to your starting destination. But, in the odyssey of life it’s very unlikely that one may return to the same destination from where they started their life journey. A true and bitter reality of life. Who are the other artistes in this movie and the role they are playing? The movie has been produced by Avdhoot Entertainment in association with Kathakaar Entertainment a Production House initiated by me. Avdhoot Entertainment has joined hands with Kathakaar Entertainment in the production of this movie. “Dombivli Return” is our first venture into Hindi. The movie is written and directed by Mahendra Teredesai who has assisted filmmaker Dr Jabbar Patel on several occasions. The movie is produced by Mahesh Taras while I am the Line Producer for this movie. The lead role of the common man Anant in this movie is being played by me. We also have Rajeshwari Sachdev (National Film Award Winner for Best Supporting Actress) playing the role of a housewife in this movie. Amol Parashar theatre actor plays the role of my brother in this movie. The friend who owns his photo studio in Dombivli has been played by Hrishikesh Joshi. We also have Siya Patil in this movie, playing the role of women from Dombivli holding different relation with Anant. Music Direction has been done by National Film Award Winner Shailendra Barve. What is the turning point in this movie and how does the plot unfolds in the end? In this movie there’s one incident that takes place in the life of Anant coming from Marathi family. That one incident is like the slip between the cup and lip for him. The message the movie gives is when everything seems certain sometimes things can go wrong in the odyssey of life be it through temptation or any other reason which can disturb one’s happy home. It’s here the word “Return” from our movie title “Dombivli Return” unfolds as the story progress. Now, whether the common man Anant is lucky enough to return to the same destination from where he started his journey of life is something to be watched in this Hindi movie titled “Dombivli Return”. 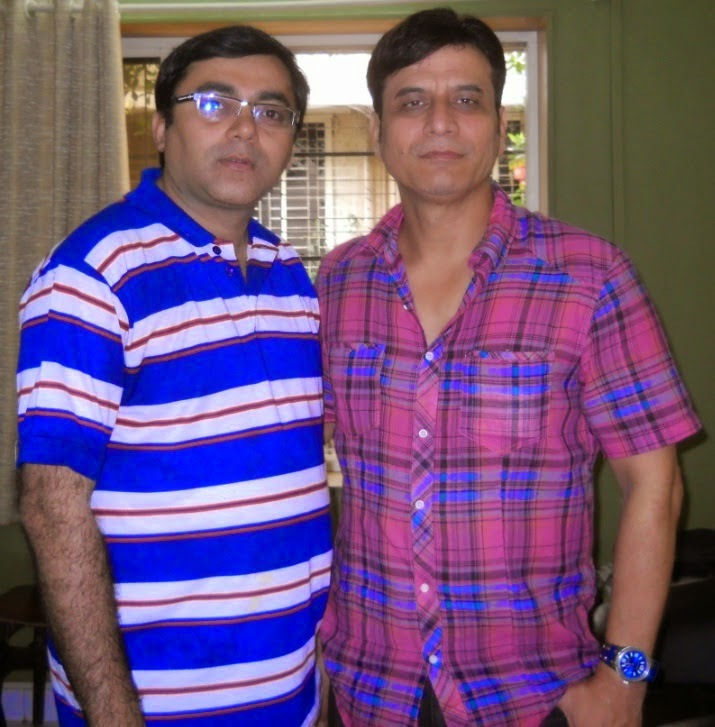 Sandeep, many Thanks for giving your best support and prompt attention as part of our freewheeling chat over cup of tea on your forthcoming Hindi movie “Dombivli Return”. Here’s wishing you and your whole crew All the Best.